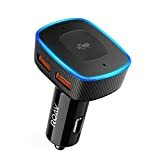 The Roav VIVA by Anker is the most popular product we covered last week, with thousands of our readers having taken advantage of the great sale Amazon had on the device. That sale, which slashed $30 off the gadget’s full retail price of $69.99, was supposed to end this past weekend. Well guess what: it didn’t. The Roav VIVA links to your smartphone for connectivity and gives you access to anything and everything you can do in your house with an Echo or Echo Dot. It’s an awesome device and if you didn’t take advantage of this killer sale last week, we strongly recommend you snag one today before this sale is over. Alexa Inside: Amazon’s voice service gives you complete voice control in your car. Just say the word to get directions, hear the latest news, shop online, play music, and more over Bluetooth, Carplay or Android Auto. What You Get: Roav VIVA, Manual, Quick Guide, Happy Card, Skills Cards, 12-month warranty and our friendly customer service. Note: Please check your car’s outlet before purchasing. If your VIVA cannot be plugged in or has connection issues with your car, return it for a full refund in 30 days. Please check the list of unsuitable car models below. If you have other issues, contact us via Live Chat in the app. May have compatibility issues playing media via Bluetooth with Doge Caravan. Try connecting your phone to your car via CarPlay or Android Auto.